We’d love your help. 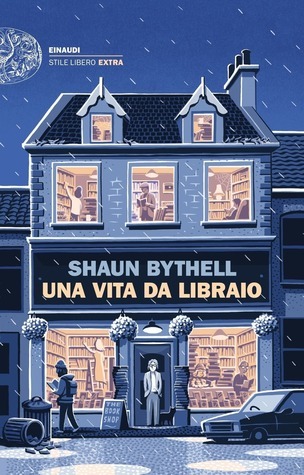 Let us know what’s wrong with this preview of Una vita da libraio by Shaun Bythell. Dal cliente che entra per complimentarsi dell'esposizione in vetrina, senza accorgersi che le pentole servono a raccogliere la perdita d'acqua dal tetto, alla vecchietta che chiama periodicamente chiedendo i titoli più assurdi, alle mille, tenere vicende di quanti decidono di disfarsi dei libri di una vita. The Book Shop, la libreria che Shaun Bythell contro ogni buonsenso ha deciso di prendere in gestione, è diventata un crocevia di storie e il cuore di Wigtown, villaggio scozzese di poche anime. To ask other readers questions about Una vita da libraio, please sign up. What does the "books found" mean at the top of every entry? This is driving me crazy! Maria It’s the number of books that came in as online orders that they were able to actually find in the shop. Took me a while to figure it out too. Call me crazy but I've always wondered when I die what will happen to all my books. My house is overflowing with them. Nobody else reads them but me. The Diary of a bookseller made me think I'm not so crazy after all. It appears there are way more crazier people in the world. It also appears most of them frequent this book shop. The funny stories abound with a daily summary of a day in the life of a bookseller in Scotland's largest 2nd hand book shop in the charming little village of Wigtown whe Call me crazy but I've always wondered when I die what will happen to all my books. My house is overflowing with them. Nobody else reads them but me. The Diary of a bookseller made me think I'm not so crazy after all. It appears there are way more crazier people in the world. It also appears most of them frequent this book shop. The funny stories abound with a daily summary of a day in the life of a bookseller in Scotland's largest 2nd hand book shop in the charming little village of Wigtown where not much else happens there except it's like a little Mecca for book lovers, a place where all manner of people come and go. Some buyers but mostly browsers which irritates Shaun the owner of the book shop to no end. He doesn't hold back on the snide commentary which makes for a lot of laughs! The customers are an odd assortment of characters, most are misers or non buyers, a few regulars and a smattering of real serious book buyers and collectors. Also some of the interactions with his regular staff are hilarious, some are clearly purposely intentionally incompetent much to Shaun's bemusement, he's a very tolerant man but secretly I think he enjoys every bit of their open contempt. I loved the outings where he goes to source books, most coming from deceased estates never knowing what kind of treasure or in most cases useless rubbish he will find. I found this book such a gem. My dream has always been to work in a bookshop and although my views are slightly tainted with the realities depicted here I am still utterly envious of the part time staffers that get to have the best job in the world in my opinion. This book won't please everyone it could prove tedious for some but for me I sure am going to be sad to leave this book, the people, the town and this bookshop. I've never wanted to visit Scotland before but now I feel almost compelled to, I feel such an affinity for this book loving town and I'm so glad places like this still exist! These are the experiences of Shaun Bythell, a bookseller in Wigtown in beautiful Scotland, in diary format. The working days, the interesting customers (problematic or not), the co-workers, the struggle to support a second-hand bookshop (the second largest in the country) in the era of technology, everything that makes bookselling such a fascinating and exhausting profession is included in this book. Despite the positive reviews and my high expectations, I have to say that I didn’t enjoy reading These are the experiences of Shaun Bythell, a bookseller in Wigtown in beautiful Scotland, in diary format. The working days, the interesting customers (problematic or not), the co-workers, the struggle to support a second-hand bookshop (the second largest in the country) in the era of technology, everything that makes bookselling such a fascinating and exhausting profession is included in this book. Despite the positive reviews and my high expectations, I have to say that I didn’t enjoy reading this at all…. There were two things that won me over and kept me going. The experiences of the author- sometimes, they proved to be real adventures- while trying to find the most appropriate books for his shop and the stories of the people linked to them. Their deceased owners and the ones that stayed behind and had to part with the books. Some of them. The rest were cruel monsters but anyway. Another interesting part is the connection of the bookshop world with Amazon and the importance of the online market in general. It was sad to learn how a mere rating in a dubious platform could influence your overall effort despite all your hard effort. In our digitalized, fast-food era, online purchases are vital for the survival of any shop. It further cemented my conviction not to support Amazon, a stance I’ve been supporting for years. On a lighter note, there were certain titles that were absolutely hilarious. Not one to judge but it definitely makes you wonder why people sometimes choose specific books. Do they buy them for the sake of research or have they organised their priorities wrong? These were the most amusing features of the book, in my opinion. Unfortunately, here end my positive thoughts regarding The Diary of a Bookseller. Apart from the content, I always pay attention to the overall tone, the ‘’voice’’ of the writer, especially when it comes to Non-Fiction and in this case, there were quite a few moments that made me contemplate whether to stop reading altogether. Forgive me for saying this, but there is a fine line between sarcasm and rudeness and, in my opinion, Bythell crossed it. He didn’t strike me as the most sympathetic person on the planet. I’m not referring to his behaviour towards the customers (although it was definitely questionable at times) but to his overall thoughts and assumptions. Perhaps it is a matter of cultural difference but certain parts left a sour taste in my mouth. Needless to say, the majority of the customers mentioned in the entries were excruciatingly ignorant so these were the only moments when I felt that his responses could be justified. Furthermore, I found his posh, high-brow attitude towards Fiction rather unfair and, in all honesty, tiresome and absurd. His comments over ‘’large’’ (as he calls them) customers sounded problematic as did his observations over ‘’female’’ customers. And truthfully, repetition over Amazon statuses or problems he had been facing with an employee day after day made this an extremely mundane read. Perhaps the most interesting feature was the inclusion of George Orwell’s quotes on books, readers and bookselling at the beginning of each chapter. I can see why many readers would enjoy The Diary of a Bookseller but the writing failed to engage me and gave me quite a few problematic moments. Therefore, I cannot possibly rate this with more than 2 stars (not that it matters, obviously) and naturally, it can’t hold a candle to Jen Campbell’s The Bookshop Book. Many thanks to Melville House Publishing and Edelweiss for the ARC in exchange for an honest review. I am always a sucker for books about books so I knew I had to read this as soon as I saw the title and the cover. So glad I did! The bookseller of the title is the author himself, Shaun Bythell. He lives in Wigtown, Scotland where this beautiful bookshop actually exists. How I would love to go and see it! Shaun has a rather snarky sense of humour which had me laughing out loud. I also found myself doing that totally annoying thing of reading bits out loud to anyone who happened to be nearby at th I am always a sucker for books about books so I knew I had to read this as soon as I saw the title and the cover. So glad I did! The bookseller of the title is the author himself, Shaun Bythell. He lives in Wigtown, Scotland where this beautiful bookshop actually exists. How I would love to go and see it! Shaun has a rather snarky sense of humour which had me laughing out loud. I also found myself doing that totally annoying thing of reading bits out loud to anyone who happened to be nearby at the time. They usually laughed too so I think we can accept it is a funny book. I enjoyed the diary format with sometimes less than half a page for a day. It made it very hard to stop at any point with a constant mental urge to read "just one more." Of course, being set in a village in Scotland, there had to be quirky characters and there are indeed plenty. Nicky was particularly entertaining although probably more so on paper than if you had to actually live with her. One of the best books I’ve read so far this year! This is a book for all book lovers or people who secretly wish to work in a bookstore. Shaun Bythell owns The Bookshop in Wigtown, Scotland, and with this book he shares his diary from 2014 in which he writes about everything going on in the store as well as in Wigtown. I had to get used to his tone of voice which is very pessimistic and abrupt - but in a funny way I grew to find this tone of voice hilarious and endearing, and after all, Shaun By One of the best books I’ve read so far this year! This is a book for all book lovers or people who secretly wish to work in a bookstore. Shaun Bythell owns The Bookshop in Wigtown, Scotland, and with this book he shares his diary from 2014 in which he writes about everything going on in the store as well as in Wigtown. I had to get used to his tone of voice which is very pessimistic and abrupt - but in a funny way I grew to find this tone of voice hilarious and endearing, and after all, Shaun Bythell is not wrong in a lot of the things he says. A reread. In April I finally made it to Wigtown, the Book Town of Scotland, and The Bookshop [for the life of me I cannot determine whether it should be The Bookshop or The Book Shop; the name on the website/Facebook page is different from the storefront! ], a wonderfully rambling place with lots of nooks and crannies housing all sorts of categories. (Look out for the shot and mounted Kindle, the Festival bed, the stuffed badger, and the scroll of bookseller’s rules.) Luckily, on our visit we fou A reread. In April I finally made it to Wigtown, the Book Town of Scotland, and The Bookshop [for the life of me I cannot determine whether it should be The Bookshop or The Book Shop; the name on the website/Facebook page is different from the storefront! ], a wonderfully rambling place with lots of nooks and crannies housing all sorts of categories. (Look out for the shot and mounted Kindle, the Festival bed, the stuffed badger, and the scroll of bookseller’s rules.) Luckily, on our visit we found £35 worth of books we wanted to buy, and had a nice chat with Bythell himself at the till. He signed my book, commiserated with us about the rainy weather and our flat tire, and gave us tips for what to see locally. You’d hardly believe that he’s the same curmudgeon who wrote the book – which makes one wonder to what extent the narrative voice is a put-on persona. I can believe that Bythell gets irate and sarcastic about bad customer behavior, but in person he struck me as easygoing and happy in his work. I started rereading the book soon after we got back (you can read my full trip write-up on my blog), and kept it as a bedside tome for months, finally finishing it about a year after its initial release. It’s now out in the USA and Australia, too, and it’s been great to see it getting more widespread attention. Alas, on a second read the everyday life of the shop felt more tedious to me, and though I could now picture the locales and some of the people described (which is why I thought a reread would be rewarding), that somehow wasn’t enough to counteract the monotony. This time around it was a 3-star read, so it averages out to a 3.5-star book for me. I’d recommend that those picking this up for the first time keep it around as a bedside/coffee table book and only read an entry or two at a time, or skim it for entries that interest them. This book is going straight onto my shelf of all time favourites. I really enjoyed reading Shaun Bythell's diary of the trials, tribulations and occasional triumphs of being a bookseller. In 2001, after having difficulty settling on a career he enjoyed, Shaun bought The Book Shop in his home town of Wigtown, in the Galloway region of Scotland. Some years later he started a diary and a facebook site to record the interactions with his customers, but over the months it developed into so much more This book is going straight onto my shelf of all time favourites. I really enjoyed reading Shaun Bythell's diary of the trials, tribulations and occasional triumphs of being a bookseller. In 2001, after having difficulty settling on a career he enjoyed, Shaun bought The Book Shop in his home town of Wigtown, in the Galloway region of Scotland. Some years later he started a diary and a facebook site to record the interactions with his customers, but over the months it developed into so much more - a record of the changing seasons and the happenings in the town, as well as a record of the selling and buying of books, dealing with Amazon and his quirky part time employee Nicky. Following closure of its main industries, a distillery and a creamery, Wigtown launched a plan in 1998 to rejuvenate itself as a Book Town like the well known popular Welsh village Hay-on-Wye and is now a popular tourist destination with a successful annual Book Festival. The Book Shop is now the second largest second hand book store in Scotland with over 100,000 books. It sounds wonderful with rooms and rooms full of books, an open fire and comfortable armchairs, and odd antiques that Shaun picks up at auctions. There is even a 'festival bed' on a mezzanine that can be booked for the festival and often used by overnight guests who stay too late or drink too much to go home. This is a fascinating book to read if you're interested in becoming a bookseller. There are all sorts of customers, the regulars, the hagglers, the ones who spend hours in the shop pulling books off the shelf and not buying. Then there is the business of buying books from auctions and deceased estates, having to get rid of the unselleable portions but also occassionally finding a gem like a rare first edition or a book signed by Florence Nightingale. There are also the trials of on-line selling and dealing with Amazon (who now seem to own everything). The compensations for Shaun are living in a beautiful part of the world, enjoying the fishing, boating and rock climbing in the quiet times with someone else minding the shop. Shaun also knows many interesting people and his involvement in organising the annual festival allows him to meet many authors and writers so there are many evenings of social company and entertainment. Shaun's one time employee Nicky also provided him with hours of amusement (as well as annoyance because she had her own ideas of how to run the shop). There are some priceless videos on youtube of Nicky (in the black ski-suit that she wore to work all winter) showing the results of her bin foraging outside the supermarket, judging the anonymous postcard competition, explaining to Shaun what happened to his creme eggs and also of Shaun and Nicky in a Book Shop rap. Shaun's video series of Kindle Tutorials on how to deal with broken kindles is also hilarious and sums up his thoughts on Amazon (there's a great photo in the book of the 'fixed kindle' from one of his tutorials). I also enjoyed Shaun discussing the books he's reading and the George Orwell quotes at the start of each month of the diary. Recommended for all those who think it would be cool to have a bookshop and for the rest of us who enjoy reading and reading about what other people are reading. The Diary of a Bookseller is the first person account of Shaun Bythell, owner of The Bookshop, a large second hand bookstore in Scotland. Over the course of the year 2014, Bythell keeps a diary of daily encounters from the shop. Some days are better than others. Irritating customers are a given. Bythell has a consistent dry sarcasm, and the details of the shop’s daily happenings are amusing. “Any bookseller will tell you that, even with 100,000 books neatly sorted and shelved in a well-lit, warm The Diary of a Bookseller is the first person account of Shaun Bythell, owner of The Bookshop, a large second hand bookstore in Scotland. Over the course of the year 2014, Bythell keeps a diary of daily encounters from the shop. Brandice Jennifer ~ TarHeelReader wrote: "Lovely review and quotes, Brandice. I’m definitely interested in this one." Thanks Jennifer, I look forward to your th Jennifer ~ TarHeelReader wrote: "Lovely review and quotes, Brandice. I’m definitely interested in this one." JanB wrote: "Bandice, this sounds like a fun campy read! 💕 Love your review!" Books excite me, but reading a book about a bookshop, excites me just that little bit more. I haven't came across many books in this kind of genre, so I really made the most of this one. The book shop, is ran by Shaun Bythell, and is located in Wigtown, Scotland. It is a seemingly successful second-hand book shop, and this book contains the diary of Bythell, which he kept for a year, and has all the events of each day recorded in it. Now, I use Amazon for books very often, and it is due to Amazo Books excite me, but reading a book about a bookshop, excites me just that little bit more. I haven't came across many books in this kind of genre, so I really made the most of this one. The book shop, is ran by Shaun Bythell, and is located in Wigtown, Scotland. It is a seemingly successful second-hand book shop, and this book contains the diary of Bythell, which he kept for a year, and has all the events of each day recorded in it. Now, I use Amazon for books very often, and it is due to Amazon, that unfortunately, many second-hand bookstores either struggle, or have gone out of business completely. I for one love mooching around a bookshop, I find it so enthralling but also comforting at the same time. It is a great shame that we don't have as many bookshops around like we used to. We obviously can thank the Internet for this! This is clearly an individual who holds a genuine passion and appreciation for books, and seemingly puts up with a great amount of rudeness from his customers. What astounded me, is the way customers come in the shop, and attempt to haggle the price of the book! It's not a car boot sale, it is a successful business that Bythell has been running efficiently for over fifteen years! For me, this book is quirky (with a capital “Q”). The story meanders along, a bit like life really. Mostly routine and humdrum, with little flecks of highlights and happiness. A journal of sorts, of the trials and tribulations of a bookseller, and in a second hand bookstore at that. ”An elderly customer told me that her book club’s next book was Dracula, but she couldn’t remember what he’d written." I enjoyed the quirky characters. Shaun, the owner of the bookstore. A bit prickly, posting barbed comments on Facebook about his customers (too funny), but who deep down seems quite sensitive, behind the detached exterior. Nicky (who works in the bookstore); a free spirit who drives an old combi van and loves hunting for food via what’s been thrown out from the local supermarket’s skip (“Foodie Fridays”, what delights will be brought in…). Sandy (the pagan), who brings in hand carved walking sticks, in exchange for books on Celtic mythology. The regular customers such a retired solicitor Mr Deacon (never shall we find out his first name), who orders books on a weekly basis, when he can quite easily buy them online, to the browsers who spend hours reading in front of the fireplace, only to leave without buying a single item. I can well imagine the kaleidoscope of personalities meeting in the melting pot of this bookstore. There were also many very sad and poignant parts of the story where Shaun goes to purchase books (sometimes entire collections) from estates. I find it bittersweet where he described that books that are left behind often capture that essence of a person. That left a lump in my throat. One of my favourite comedies from the early '00's was Black Books, a comedy set in a second hand book shop and starring Dylan Moran as a misanthropic book seller who hates people and drinks copious amounts of wine. This is the book equivalent to that comedy, and I absolutely loved it. The book outlines a year in the life of Shaun Bythell, owner of The Book Shop, and his daily interactions with customers and excur I received a copy of this book from the publisher in exchange for an honest review. The book outlines a year in the life of Shaun Bythell, owner of The Book Shop, and his daily interactions with customers and excursions to source books. It's never pretentious, and often very, very funny. I particularly warmed to shop assistant Nicky, who is basically described as a wombling Jehovah's Witness, who often turns up to her shifts in the book shop in an all in one black ski suit with an accompanying assortment of food found in the skip behind Morrisons. The daily struggle with customers was also very funny and informative - I gained a particular fondness for regular customer Mr Deacon, but ultimately reminded me that I never want another career in retail! The book serves as a great insight into the dying breed of booksellers, and provided a lot of information about books that I didn't know, such as books published before 1501 known as 'incunabula'. I liked the little excerpts from George Orwell which proceeded every month too, as they provided some cohesiveness to the structure of the book and made it feel less like a traditional diary. I think the only section I didn't enjoy was where the author got sidetracked talking about fishing for a few pages in August. Again, they only lasted a few pages, but they felt a little bit out of place. What a depressing book! Bythell manages to make one of my favorite destinations, a used bookstore, feel like an unwelcoming hellhole. The book is a gloomy, lazily written diary of his daily transactions peppered with snarky, mean-spirited comments about his customers. There is very little in this book about reading or even books - except as crumbling objects to buy and sell. Shaun Bythell kept a one year diary covering his book shop - and also his life and the lives of some of those around him. It's a very entertaining read, though I wish that he had given more ink to some of the more pleasant experiences that probably occurred in his shop. (I'm sure that there must have been more than he related.) The more bizarre or annoying experiences made good reading, but more positive experiences would have made for a better balanced book. Mr. Bythell seems to be a bit of a c Shaun Bythell kept a one year diary covering his book shop - and also his life and the lives of some of those around him. It's a very entertaining read, though I wish that he had given more ink to some of the more pleasant experiences that probably occurred in his shop. (I'm sure that there must have been more than he related.) The more bizarre or annoying experiences made good reading, but more positive experiences would have made for a better balanced book. Mr. Bythell seems to be a bit of a curmudgeon, so perhaps that accounts for many of the episodes he included. I knew before I read this that I wouldn't want to own a bookstore - especially a used bookstore - but reading this book settled any notion of ever doing that completely. And if any potential bookstore owner reads this, they'll learn a quick lesson on hiring employees - don't follow Shaun Bythell's example. I believe that the only worthwhile employee he had during the year of the diary was a young woman who was foisted upon him by a friend, and who worked there for a very short time. His fulltime employee, Nicky, had one positive trait. She was pretty dependable about showing up for work. Beyond that, the best that could be said is that sometimes she was charmingly weird, but oftentimes just plain weird - no charm included. As far as being an employee or a co-worker, I wouldn't want her for either. Who would've thought I'd have tears in my eyes as I closed this book? So, a five it gets. I can highly recommend this book to most any reader, especially those of us who have dreamed of owning our own bookshops. The shop owner (and author) is as crotchety as they come, but at his heart, he is a good man who cares about his community. There is a touch of the romantic in there, too. I found him an interesting person to get to know, and I really hope he keeps writing. This book made me laugh out lo Who would've thought I'd have tears in my eyes as I closed this book? So, a five it gets. This book made me laugh out loud til my stomach hurt (2 September entry), it made me think about things like the future of the paper book industry, customer service in the digital age, the behemoth that Amazon has become in, let's face it, nearly all of our lives, etc. But more than that, Shaun really did give me a good glimpse into the life of a bookseller. The fact that he lives and works in a seaside Scottish village in a really old house that contains his shop was the rich, thick chocolate icing on the cake for me in this one. I got to know his partner, his employees, some regular customers, other booksellers / shop owners, and I thoroughly enjoyed myself every time. There is a diary entry for each day, ranging from one or two paragraphs to about a page in length. Of course, each day naturally led on to the next, and I interestingly found myself preferring the library paper copy to my digital Audible version, which is something I think Shaun would be happy to hear. It was the epilogue that brought tears to my eyes, but never fear. The BookShop in Wigtown, Scotland is still open. I've been an Amazon customer for many years, but I'm going to make a concerted effort to patronize independent shops, even tho we no longer have one locally (because of Amazon). I understand the book business much better now and once again, Scotland calls. I hope I get to see The BookShop one day. It it not easy to write a book in the diary format without falling into the trap of repeating yourself. I got up, opened the shop, Nicky was late. How very often did those words recur. It takes a writer of considerably more skill and imagination to make a diary interesting. One who can offer nuggets of insight (perhaps in response to the books he was reading above the bald comment "I enjoyed it") or the odd piece of imagery. This book failed on those counts. It had the stock in trade ornery employee, the obligatory grumpy bookseller (towards the end of the book, perhaps alerted by a reader or editor, there was a defensive paragraph about how he was only rude to customers and never to waitresses or shop assistants, but waitresses and shop assistants are not as downtrodden and unable to answer back as you may think - viz his own staff! - and some of the customers seemed tactless or inept rather than deliberately offensive. Mr. Deacon's dementia was there for all to see). Such a beautiful book about books & book selling. I already know what book I'm getting my friends for Christmas because this was hilarious & spoke to my misanthropic heart. Wigtown is a beautiful rural town nestling in the south west of Scotland, and it has been designated as Scotland's official BookTown. It is home to a range of bookshops and book-related businesses as well as its own book festival. The Bookshop in Wigtown is Scotland's largest second-hand bookshop, with around 100,000 items of stock and miles of shelves, an open fire and nooks and crannies to lose yourself in. The proprietor of this bibliophile heaven is Shaun Bythell and on the 5th February 2014, Wigtown is a beautiful rural town nestling in the south west of Scotland, and it has been designated as Scotland's official BookTown. It is home to a range of bookshops and book-related businesses as well as its own book festival. The Bookshop in Wigtown is Scotland's largest second-hand bookshop, with around 100,000 items of stock and miles of shelves, an open fire and nooks and crannies to lose yourself in. The proprietor of this bibliophile heaven is Shaun Bythell and on the 5th February 2014, he decided to start keeping a diary of the things that happened in the shop. Over the next year, he tells us just how it is running a bookshop in the modern world, from battling against the 1100lb gorilla that is Amazon to travelling around Scotland looking at collections of books, hoping, but not expecting to come across that rare book that he knows will sell. Whilst he likes to have paying customers through the doors, it is his financial lifeblood, after all, there are certain types that he is critical of. Those that cross the threshold declaring a love of all things bookish are frequently the ones who leave empty-handed. He argues with customers who think that a second-hand bookshop should only stock titles that are £1 each and catching those that surreptitiously amended the prices of the books. There are a few professions that you know going in are never going to lead to you having eff you money. Teacher, public defender, librarian, fashion designer for one-legged armadillos…all of these are things you have to absolutely love if you’re going to make them your life’s work. You can add secondhand bookseller to that list. Enter Shaun Bythell, owner and proprietor of The Bookship in Wigtown (Scotland’s largest secondhand bookstore), who willingly accepts the economic challenges of owning a There are a few professions that you know going in are never going to lead to you having eff you money. Teacher, public defender, librarian, fashion designer for one-legged armadillos…all of these are things you have to absolutely love if you’re going to make them your life’s work. You can add secondhand bookseller to that list. Enter Shaun Bythell, owner and proprietor of The Bookship in Wigtown (Scotland’s largest secondhand bookstore), who willingly accepts the economic challenges of owning a used bookshop, a challenge exacerbated by the shop’s location in a relatively unknown region of Scotland, in exchange for the freedom to be his own boss and respond to the occasionally stupid customer with just the right level of subtle snark. Presented in the form of daily entries over the course of a year, Bythell’s diary details the humdrum minutiae of life in his shop (which doubles as his home)—the challenge of finding and fulfilling online orders in a store that features more than 100,000 books, some of which are categorized using no logic whatsoever by one of the shop assistants; the daily flow of sales and foot traffic, which can sometimes be depressingly small; the year-round activities of the sleepy town of Wigtown, which rouses itself mightily for an annual book festival; social media efforts to promote the store, including some fairly comical video endeavors; the thrill—and frequent disappointment—of acquiring books; passing details of Bythell’s romantic relationship with a writer; and a breakdown of the quirky characters, both shop helpers and regular clients and friends, who populate Bythell’s life. At the beginning of each month, he makes some broader observations about the business, literature, and life in general. The entries can become repetitive, but book lovers will eat it up, and the shop’s eccentric (and sometimes epically stupid) customers, in combination with Bythell’s drier-than-wine-squeezed-from-the-President’s-grapes* sense of humor, give it a broader appeal. As a former register jockey in an (long since closed) independent bookstore, I’ve had a tiny taste of the very weird fruits of Bythell’s world, and it was both comforting and depressing to spend a year looking over his shoulder. Comforting to know that somewhere out there, someone is still fighting the good fight to make beautiful physical books available (even going so far as to literally shoot and mount Kindles in his store as a warning to would-be partakers* of digital literature), and doing it with a sense of humor; depressing to contemplate, as Bythell himself does, that he’s a member of a dying breed, and that it’s not unlikely that there will eventually come a day when a place like the Bookshop simply ceases to exist. If I can get annoyingly contemplative for a moment, it is, on the whole, probably a good thing that, at some point (albeit a more distant point in the future than we all originally thought), physical books will be relics of the past—why destroy trees and create more and more environmental pollutants to create and ship books around the world when the same content can be delivered to you instantly on a slick device that enables you to read one-handed in the dark (such as, for example, when you’re soothing colicky infants, and you’re able to increase your reading threefold as a result because THEY NEVER EVER SLEEP (though I’m over that, I promise))? Still, like all of you other bibliophiles, I love the feel of a book in my hand, and the wonder and magic of walking into a bookstore—a place filled with seemingly infinite information and adventures—has never diminished. Then again, I get nostalgic for Meat Loaf albums, Saved by the Bell, and Trapper Keepers, so what do I know? *I’m sorry; that’s not an image that should live in anyone’s head. But, it’s living in mine, so you WILL SHARE MY MISERY AND YOU WILL LIKE IT! Paige Turner I fourth that recommendation! Hear-hear to Black Books. A fun book to read for anyone who has been a bookseller, or anyone in a retail environment really. Sometimes customers defy description. I chose to read this a few entries at a time, as diaries can be tedious when read straight through. Perfect bedtime reading. У книгарні холодно й тихо, як у могилі. Треба, між іншим, спитати в Нікі, чи ніхто з наших постійних клієнтів останнім часом не помер. Жило-було провінційне шотландське містечко Віґтаун, і це реально дупа світу. Містечко стоїть у нетуристичному районі, про який забуло навіть Національне туристичне агентство Шотландії, нормального транспортного сполучення до нього нема, а обидва, так би мовити, "градообразующіх" підприємства закрилися з тріском, так що місцеве населення (під У книгарні холодно й тихо, як у могилі. Треба, між іншим, спитати в Нікі, чи ніхто з наших постійних клієнтів останнім часом не помер. Жило-було провінційне шотландське містечко Віґтаун, і це реально дупа світу. Містечко стоїть у нетуристичному районі, про який забуло навіть Національне туристичне агентство Шотландії, нормального транспортного сполучення до нього нема, а обидва, так би мовити, "градообразующіх" підприємства закрилися з тріском, так що місцеве населення (під тисячу осіб) масово сидить без роботи. Загалом, на наші гроші це селище міського типу Щебзавод Житомирської області, тільки ще гірше (бо у Щебзаводі є підприємства і електричка). В якийсь момент містечко вирішує, що так більше жити не можна, і з розпачу проголошує себе Містом книги, бо гірше не стане у будь-якому разі. Ну а так може якийсь наївний турист зацікавиться, чого це місто книги стоїть у такій дупі світу, і з'їздить, правда ж? Коротше, в містечку відкривають купу книгарень і починають лабати літературний фестиваль - і вже за двадцять років усе це виглядає дуже пристойно. "Щоденник книгаря" - це щоденник власника однієї з віґтаунських книгарень (другої за розміром букіністичної книгарні Шотландії!) за 2014 рік. Оскільки це щоденник, то бурхливого сюжету можна не чекати, зате можна чекати дуже заспокійливого й медитативного життя шотландської провінції, ексцентриків, які ходять там книгарнями, і оцього от усього. Коротше, це як хюґґе, тільки з шотландськими мудаками й алкоголіками замість пледиків. Have you ever dreamt of owning a bookshop? Then this book is for you. This is something as rare as a book that actually lives up to its title. This is nothing more, nothing less, than the diary of a bookseller. Shaun Bythell owns Scotland's largest second hand bookshop located in Wigtown. And this book is his diary of his business life. In here you'll find hilarious anecdotes about the costumers he's met, notes about how much he has sold and earned each day, musings about the book business in gen Have you ever dreamt of owning a bookshop? Then this book is for you. Shaun Bythell owns Scotland's largest second hand bookshop located in Wigtown. And this book is his diary of his business life. In here you'll find hilarious anecdotes about the costumers he's met, notes about how much he has sold and earned each day, musings about the book business in general and the rise of Amazon, notes about which books he has bought for his store and how – mixed with a few passing notes of Bythell's everyday life. It is quite simple, actually. But also endlessly charming and hilarious. I read it quickly and I enjoyed it thoroughly. Bythell has so many fun anecdotes to tell – and yet, he also offers some very brutal facts about the book industry today and the harsh reality of bookselling in general. Un anno in una libreria dell'usato in un paesino semi-sperduto della Scozia. Questo è il periodo di tempo che trascorreremo in compagnia di Shaun e del suo "book shop". Un anno tra miracoli e peripezie per riuscire a rimanere a galla nonostante le mille difficoltà: il colosso Amazon che tutto distrugge, la clientela che va dallo strambo al molesto e Nicky, commessa/subordinata odiosa e spocchiosa fino all'esaurimento. Scaffali impolverati, pile di libri di ogni genere e amore per la lettura. Una s Un anno in una libreria dell'usato in un paesino semi-sperduto della Scozia. Questo è il periodo di tempo che trascorreremo in compagnia di Shaun e del suo "book shop". Un anno tra miracoli e peripezie per riuscire a rimanere a galla nonostante le mille difficoltà: il colosso Amazon che tutto distrugge, la clientela che va dallo strambo al molesto e Nicky, commessa/subordinata odiosa e spocchiosa fino all'esaurimento. Una storia, un memoir, sicuramente simpatico e leggero, ricco di spunti e aneddoti interessanti. Un po' troppo lungo forse, la lettura perde verve superata la metà: un pochino più breve forse era meglio. Libro senza pretese da leggere a cuor leggero. I really enjoyed this book which I received as a xmas present. Full of quirky characters and an insight into running a bookshop; it has a lot of laugh out loud moments. The Bookshop also has a facebook page which I googled and you can order books online through there too, helping to maintain the shop. A visit to this shop will be a must for me in the future! продавцям книжок не обов'язково бути цікавезними людьми. ба більше, вони навіть не мусять уміти захопливо розповідати про книжки – чи про будь-що. тож щодо цього у мене до байтелла нема претензій: у нього вийшов доволі приємний книгарський щоденник (рівно рік – від 5 лютого 2014 до 4 лютого 2015 року, з епіграфами з джорджа орвелла для кожного місяця – виявляється, він теж якось працював у книгарні). і, раз це щоденник, від початку зрозуміло, що ні тяглості, ні завершеності окремих ліній від ньо продавцям книжок не обов'язково бути цікавезними людьми. ба більше, вони навіть не мусять уміти захопливо розповідати про книжки – чи про будь-що. тож щодо цього у мене до байтелла нема претензій: у нього вийшов доволі приємний книгарський щоденник (рівно рік – від 5 лютого 2014 до 4 лютого 2015 року, з епіграфами з джорджа орвелла для кожного місяця – виявляється, він теж якось працював у книгарні). і, раз це щоденник, від початку зрозуміло, що ні тяглості, ні завершеності окремих ліній від нього теж не варто сподіватися. Books about bookstores are one of my favorite genres, and there are not many of them. Shaun Bythell bought a second hand bookshop in Wigtown, Scotland which near the coast of the Irish Sea, and Stranraer which has a ferry to Belfast. It has an annual book festival, which the book makes clear is the highlight of their annual calendar. Bythell walked away from a "real" job and bought the business about 15 years ago. Living in an old stone building in rainy and often cold Scotland is challenging, bu Books about bookstores are one of my favorite genres, and there are not many of them. Shaun Bythell bought a second hand bookshop in Wigtown, Scotland which near the coast of the Irish Sea, and Stranraer which has a ferry to Belfast. It has an annual book festival, which the book makes clear is the highlight of their annual calendar. Bythell walked away from a "real" job and bought the business about 15 years ago. Living in an old stone building in rainy and often cold Scotland is challenging, but not as challenging as running a bookshop of any kind in the age of Amazon. The review of the book in the Guardian pointed out that although the book is full of humorous stories of customers, shop employees, and the town, is primarily seething with anger. Amazon has not simply changed the book business, it has driven most bookshops including used booksellers out of business. It has also changed customers. So many of his customers demanded discounts, or complained a book was too expensive. Sometimes they were wrong. If they paid Amazon's shipping charges, they'd be spending more. Very very few appreciated, it seemed, the value of a bookshop. This owner carefully researches prices, and the books that he stocks. He drives as far as Edinburgh to help people get rid of their books. Often they are moving or someone has passed away. It is a lot of work, especially hauling all the boxes of books around. Yet one customer who asked how he got his books and was told that he bought them from people getting rid of their books, turned and told his wife " See I told you he got them for free". The book is the story of someone who appreciates and loves books. He probably doesn't love many of his customers who will astound readers with their rudeness. Thankfully the tide is turning against e-books and back to physical books. I don't think I will ever go into a bookstore again and leave empty handed, as many of his customers do. There are many who come in (and some are belligerent) asking if he has a certain book. When he does, they almost never buy it. I cannot imagine arguing with a used bookshop about the price of a book, but it happens often in his shop. Somehow he has held out for 15 years. This is a book that readers who love bookshops will enjoy. It will probably bring more visitors to Wigtown and hopefully some of them will buy a book. Oh Shaun, your hatred for Kindles and stroppy, tight-fisted customers shines through in your highly entertaining diary! I wish I could get away with customer service 'Bythell Style', but I doubt I'd be employed for very long! The advantages of being your own boss I guess. I thoroughly e Oh Shaun, your hatred for Kindles and stroppy, tight-fisted customers shines through in your highly entertaining diary! I wish I could get away with customer service 'Bythell Style', but I doubt I'd be employed for very long! The advantages of being your own boss I guess. I thoroughly enjoyed The Diary of a Bookseller, what's not to love?! For starters, it's about a second hand bookshop in my most favourite place ever. SCOTLAND. It gave me a fascinating insight into being part of the second hand book industry, and it definitely isn't all bookish loveliness. Hey, Shaun, I'm coming up for a visit in the summer. I promise I'll put the books I look at back where I found them. (Even if they are possibly in the wrong section already. Sigh.....*Shakes head*). I promise I won't come in armed with a pencil, writing in my own prices on the inside page. I am SHOOK that book lovers even do this! And I'll BUY some books too. And possibly a walking stick. Being a true bibliophile, I have always loved books about bookshops and the book industry. Also, Black Books, the old tv series about a bookshop and it’s cantankerous alcoholic owner, is one of my favourite shows as well. As a result this book is a match made in Heaven for me. While not as rude, belligerent, or gross as the owner of the shop in Black Books, the author, and owner of the shop in the book, Shaun Bythell, does have a similarity when it comes to customer relations. The book is basica Being a true bibliophile, I have always loved books about bookshops and the book industry. Also, Black Books, the old tv series about a bookshop and it’s cantankerous alcoholic owner, is one of my favourite shows as well. As a result this book is a match made in Heaven for me. While not as rude, belligerent, or gross as the owner of the shop in Black Books, the author, and owner of the shop in the book, Shaun Bythell, does have a similarity when it comes to customer relations. The book is basically a collection of anecdotes and stories of his daily life, concentrating on the customers, in the bookshop. The bookshop is the second largest second hand bookshop in Scotland and provides the scene for some hilarious, eccentric customers. I think I had a smile on my face the whole time I was reading this book. The book also provides a look into the world of a second hand bookshop and the troubles these shops are facing from the internet. Sites such as Amazon (whoops there goes my goodread account) are gobbling up these shops at an alarming rate. This book is a delightful, enjoyable read which I’m sure most bibliophiles (and lovers of Black Books) will enjoy. 4 Stars. Is it just because I used to be an antiquarian bookseller that I loved this book or because I've written novels starring antiquarian booksellers? I don't think so. Funny, revealing (especially about the devastating impact of Amazon), and full of curmudgeonly charm—more than anything this book made me want to go to Wigtown! It's extremely repetitive and not as funny as the author clearly thinks. Getting through those diary entries was just such a chore and it brought me, as a reader, ZERO fun, just made me yawn and eye roll and sigh. Shaun Bythell is the owner of The Bookshop in Wigtown, Scotland's National Book Town, and also one of the organisers of the Wigtown Festival. When not working amongst The Bookshop’s mile of shelving, Shaun’s hobbies include eavesdropping on customers, uploading book-themed re-workings of Sugarhill Gang songs to YouTube and shooting Amazon Kindles in the wild. https://www.facebook.com/thebookshopw... Shaun Bythell is the owner of The Bookshop in Wigtown, Scotland's National Book Town, and also one of the organisers of the Wigtown Festival.